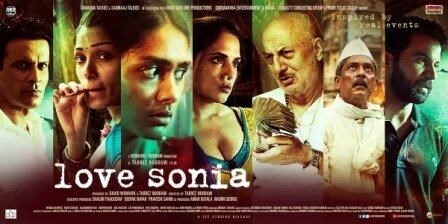 Tamasha Talkies and Samraaj Talkies in association with India Take One Productions, Cinemantra Entertainment & Dynasty Consulting Group present Love Sonia. The film is Tabrez Noorani's directorial debut, produced by the Academy Award nominated producer of Life of Pi, David Womark and Tabrez Noorani. Co-produced by Amar Butala, the movie's executive producers include Shalini Thackeray, Deepak Nayar and Pravesh Sahni. The film has strong ensemble cast of Manoj Bajpayee, Richa Chadha, Rajkummar Rao, Anupam Kher, Sai Tamhankar, Adil Hussain, Demi Moore, Mark Duplass with Freida Pinto and introducing Mrunal Thakur and Riya Sisodiya.